The trucking industry represents a growing source of employment. Nearly 1.8 million drivers work in the United States, and the government predicts that companies will create around 90,000 new jobs in the decade leading up to 2024 (source). To succeed in this field, it’s vital to maintain and improve your skills. 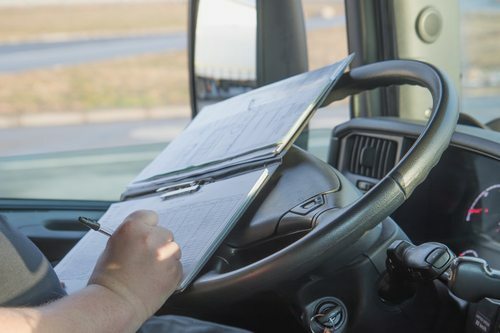 Consider taking a truck driver refresher course if you possess a commercial driver’s license (CDL) but haven’t driven a freight truck for a long time. You can refresh your skills and knowledge, gain confidence, and secure a great new job. Why Attend a Truck Driver Refresher Course? When they temporarily stop driving, some truckers begin to lose crucial abilities or forget important rules. This makes it harder to operate vehicles safely and efficiently. Furthermore, trucking industry practices or laws may change during a lengthy absence. Refresher courses address these problems with a combination of classroom education and direct training, leaving out the basic material instructors teach to brand new drivers. There are several reasons why truckers participate in refresher courses. Some individuals feel that they need this training to safely return to the road after a break. Perhaps you haven’t left the industry for any length of time, but you’re feeling less confident about driving. This might happen after you relocate or switch to a different truck. A refresher course could sharpen the skills needed to restore your confidence and ensure that you can drive safely. It may also prove desirable if a supervisor blames your driving techniques for cargo damage or a traffic accident. Other drivers take a refresher course to qualify for new jobs. Many employers expect drivers to attend refresher classes after they stop working for a year or longer. Even if a firm doesn’t require it, this training will enhance your resume and increase the likelihood that a manager will hire you rather than someone else. Truck insurers value the safety benefits associated with refresher courses, and they have a strong motivation to prevent tractor-trailer crashes because this equipment costs a massive amount of money to replace. Trucks also inflict tremendous damage when they hit smaller automobiles. Consequently, refresher training may reduce insurance premiums for you or your employer. In some situations, it’s not possible to gain coverage without attending a class. A manager may require that you undergo training to satisfy the insurer. This type of course also provides plenty of opportunities for students to drive trucks in a safe practice area. Schools often personalize refresher classes to suit drivers’ specific needs. An instructor may test your existing skills before you begin the course. Training customization enables you to focus on improving deficient abilities, such as turning, docking, or backing. The trainer may also shorten or lengthen a course depending on your skill level. On the other hand, some schools provide the same amount of personalized education to all students. The classes usually last one to three weeks. To sum it up, a truck driver refresher course enhances your employment prospects while teaching you to drive more safely and confidently. Each school has different requirements that you must meet before attending a class. For example, you might need to disclose your driving record, undergo drug testing, and complete various forms. You will also need a valid CDL to receive training. These expectations ensure the safety of instructors and prevent equipment damage. Are you ready to sign up for a truck driver refresher course? Check out Truck Dynasty Driving Academy. In addition to a full training program for new drivers, we offer a refresher course that current drivers can use to sharpen and develop their skills. It is offered in a one- or two-week timeframe increment, and drivers’ skills are evaluated prior to enrollment to determine whether a two-week curriculum is required. To better understand what each week will contain, view the Week One Curriculum and Week Two Curriculum. To get started, please give us a call at 417-831-8188, e-mail us at info@tddallc.com, or contact us online. We look forward to hearing from you!